For other uses, see Silhouette (disambiguation). 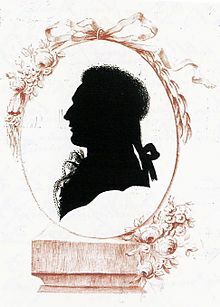 Cutting portraits, generally in profile, from black card became popular in the mid-18th century, though the term silhouette was seldom used until the early decades of the 19th century, and the tradition has continued under this name into the 21st century. They represented a cheap but effective alternative to the portrait miniature, and skilled specialist artists could cut a high-quality bust portrait, by far the most common style, in a matter of minutes, working purely by eye. Other artists, especially from about 1790, drew an outline on paper, then painted it in, which could be equally quick. From its original graphic meaning, the term silhouette has been extended to describe the sight or representation of a person, object or scene that is backlit, and appears dark against a lighter background. Anything that appears this way, for example, a figure standing backlit in a doorway, may be described as "in silhouette". Because a silhouette emphasises the outline, the word has also been used in the fields of fashion and fitness to describe the shape of a person's body or the shape created by wearing clothing of a particular style or period. The word silhouette is derived from the name of Étienne de Silhouette, a French finance minister who, in 1759, was forced by France's credit crisis during the Seven Years' War to impose severe economic demands upon the French people, particularly the wealthy. Because of de Silhouette's austere economies, his name became synonymous with anything done or made cheaply and so with these outline portraits. Prior to the advent of photography, silhouette profiles cut from black card were the cheapest way of recording a person's appearance. “cut and paste” where the figure was cut out of dark paper (usually free-hand) and then pasted onto a light background. In accord with the myth, Greek Black-figure pottery painting, also known as the black-figure style or black-figure ceramic (Greek, μελανόμορφα, melanomorpha, common between the 7th and 5th centuries BC) employs the silhouette and characteristic profile views of figures and objects on pottery forms. The pots themselves exhibit strong forms in outline that are indicators of their purpose, as well as being decorative. For the depiction of portraits, the profile image has marked advantage over a full-face image in many circumstances, because it depends strongly upon the proportions and relationship of the bony structures of the face (the forehead, nose and chin) making the image is clear and simple. For this reason profile portraits have been employed on coinage since the Roman era. The early Renaissance period saw a fashion for painted profile portraits and people such as Federico da Montefeltro and Ludovico Sforza were depicted in profile portraits. The profile portrait is strongly linked to the silhouette. Recent research at Stanford University indicates that where previous studies of face recognition have been based on frontal views, studies with silhouettes show humans are able to extract accurate information about gender and age from the silhouette alone. This is an important concept for artists who design characters for visual media, because the silhouette is the most immediately recognisable and identifiable shape of the character. A silhouette portrait can be painted or drawn. However, the traditional method of creating silhouette portraits is to cut them from lightweight black cardboard, and mount them on a pale (usually white) background. This was the work of specialist artists, often working out of booths at fairs or markets, whose trade competed with that of the more expensive miniaturists patronised by the wealthy. A traditional silhouette portrait artist would cut the likeness of a person, freehand, within a few minutes. Some modern silhouette artists also make silhouette portraits from photographs of people taken in profile. These profile images are often head and shoulder length (bust), but can also be full length. 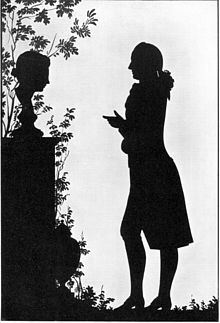 The work of the physiognomist Johann Caspar Lavater, who used silhouettes to analyse facial types, is thought to have promoted the art. The 18th century silhouette artist August Edouart cut thousands of portraits in duplicate. His subjects included French and British nobility and US presidents. Much of his personal collection was lost in a shipwreck. In England, the best known silhouette artist, a painter not a cutter, was John Miers, who travelled and worked in different cities, but had a studio on the Strand in London. He advertised "three minute sittings", and the cost might be as low as half a crown around 1800. Miers' superior products could be in grisaille, with delicate highlights added in gold or yellow, and some examples might be painted on various backings, including gesso, glass or ivory. The size was normally small, with many designed to fit into a locket, but otherwise a bust some 3 to 5 inches high was typical, with half- or full-length portraits proportionately larger. White on black by Hans Christian Andersen. In America, silhouettes were highly popular from about 1790 to 1840. The physionotrace apparatus invented by Frenchman Gilles-Louis Chrétien in 1783-84 facilitated the production of silhouette portraits by deploying the mechanics of the pantograph to transmit the tracing (via an eyepiece) of the subject's profile silhouette to a needle moving on an engraving plate, from which multiple portrait copies could be printed. The invention of photography signaled the end of the silhouette as a widespread form of portraiture. The skill was not lost, and travelling silhouette artists continued to work at state fairs into the 20th century. The popularity of the silhouette portrait is being reborn in a new generation of people who appreciate the silhouette as a nostalgic way of capturing a significant occasion. In the United States and the UK silhouette artists have websites advertising their services at weddings and other such functions. In England there is an active group of silhouette artists. In Australia, S. John Ross plied his scissors at agricultural shows for 60 years until his death in 2008. Other artists such as Douglas Carpenter produce silhouette images using pen and ink. Since the late 18th century, silhouette artists have also made small scenes cut from card and mounted on a contrasting background like the portraits. These pictures, known as "paper cuts", were often, but not necessarily, silhouette images. Among 19th century artists to work in this way was the author Hans Christian Andersen. The modern artist Robert Ryan creates intricate images by this technique, sometimes using them to produce silk-screen prints. In the late 19th and early 20th century several illustrators employed designs of similar appearance for making book illustrations. Silhouette pictures could easily be printed by blocks that were cheaper to produce and longer lasting than detailed black and white illustrations. Silhouette pictures sometimes appear in books of the early 20th century in conjunction with colour plates. (The colour plates were expensive to produce and each one was glued into the book by hand.) Illustrators who produced silhouette pictures at this time include Arthur Rackham and William Heath Robinson. In breaking with literal realism, artists of the Vorticist, Futurist and Cubist movements employed the silhouette. Illustrators of the late 20th century to work in silhouette include Jan Pienkowski and Jan Ormerod. In the early 1970s, French artist Philippe Derome uses the black cut silhouette in his portraits of black people. In the 21st century, American artist Kara Walker develops this use of silhouette to present racial issues in confronting images. Originating in the orient with traditions such as the shadow theatres of Indonesia, the shadow play became a popular entertainment in Paris during the 18th and 19th century. In the Paris of the late 19th century, the shadow theatre was particularly associated with the cabaret Le Chat Noir where Henri Rivière was the designer. Since their pioneering use by Lotte Reiniger in silent films, silhouettes have been used for a variety of iconic, graphic, emotional, or conversely for distancing, effects in many movies. These include many of the opening credit sequences of the James Bond films. The opening sequence of the television series Alfred Hitchcock Presents features a silhouetted profile of Alfred Hitchcock stepping into a caricatured outline of himself, and in his movie Psycho the killer in the shower scene manifests as a terrifying silhouette. A scene from E.T. showing the central characters on a flying bicycle silhouetted against the full moon became a well-known movie poster. Harry Potter and the Deathly Hallows – Part 1 contains an animated sequence in silhouette illustrating a short story The Tale of the Three Brothers that is embedded in the film. The sequence was produced by Ben Hibon for Framestore, with artwork by Alexis Lidell. Silhouettes have also been used by recording artists in music videos. One example is the video for "Buttons" by The Pussycat Dolls, in which Nicole Scherzinger is seen in silhouette. Michael Jackson used his own distinctive silhouette both on stage and in videos such as "You Rock My World". Early iPod commercials portrayed silhouetted dancers wearing an iPod and earbuds. The cult television program, Mystery Science Theater 3000 features the three main characters of the series watching a movie as silhouettes at the bottom of the screen. The discipline of architecture that studies the shadows cast by or upon buildings is called Sciography. The play of shadows upon buildings was very much in vogue a thousand years ago as evidenced by the surviving examples of "mukarnas" art where the shadows of 3 dimensional ornamentation with stone masonry around the entrance of mosques form pictures. As outright pictures were avoided in Islam, tessellations and calligraphic pictures were allowed, "accidental" silhouettes are a creative alternative. Many photographers use the technique of photographing people, objects or landscape elements against the light, to achieve an image in silhouette. The background light might be natural, such as a cloudy or open sky, mist or fog, sunset or an open doorway (a technique known as contre-jour), or it might be contrived in a studio; see low-key lighting. Silhouetting requires that the exposure be adjusted so that there is no detail (underexposure) within the desired silhouette element, and overexposure for the background to render it bright; so a lighting ratio of 16:1 or greater is the ideal. The Zone System was an aid to film photographers in achieving the required exposure ratios. High contrast film, adjustment of film development, and/or high contrast photographic paper may be used in chemical-based photography to enhance the effect in the darkroom. With digital processing the contrast may be enhanced through the manipulation of the contrast curve for the image. In media the term "to silhouette" is used for the process of separating or masking a portion of an image (such as the background) so that it does not show. Traditionally silhouettes have often been used in advertising, particularly in poster design, because they can be cheaply and effectively printed. The word "silhouette", because it implies the outline of a form, has been used in both fashion and fitness to describe the outline shape of the body from a particular angle, as altered by clothing in fashion usage, and clothed or unclothed where fitness is concerned, (e.g. a usage applied here by the Powerhouse Museum). Advertising for both these fields urges people, women in particular, to achieve a particular appearance, either by corsetry, diet or exercise. The term was in use in advertising by the early 20th century. Many gyms and fitness studios use the word "silhouette" either in their name or in their advertising. Historians of costume also use the term when describing the effect achieved by the clothes of different periods, so that they might describe and compare the silhouette of the 1860s with that of the other decades of the 19th century. A desirable silhouette could be influenced by many factors. The invention of crinoline steel influenced the silhouette of women in the 1850s and 60s. The posture of the Princess Alexandra influenced the silhouette of English women in the Edwardian period. See advertisement left. Because silhouettes give a very clear image, they are often used in any field where the speedy identification of an object is necessary. Silhouettes have many practical applications. They are used for traffic signs (see pic below). They are used to identify towns or countries with silhouettes of monuments or maps. They are used to identify natural objects such as trees, insects and dinosaurs. They are used in forensic science. Silhouettes of ships, planes, tanks, and other military vehicles are used by soldiers and sailors for learning to identify different craft. For interviews, some individuals choose to be videotaped in silhouette to mask their facial features and protect their anonymity, typically accompanied by a dubbed voice. This is done when the individuals may be endangered if it is known they were interviewed. Human silhouette targets are use for military, police and civilian firearms training. A digital target range at the firearms training simulator on Kunsan Air Base waits to be used. Metallic silhouette is a popular outdoor shooting sport using either rifles or handguns. In metallic silhouette shooting only knock down steel targets in the shape of animals are used. Metallic silhouette targets featuring a chicken, pig, turkey and ram, scaled to appear as they would if placed at the correct distances from the shooter. Scale in minutes of angle, correct for NRA high power rifle using yards. Traffic signs often use silhouettes. This sign warns that the road crosses a railway line. The flag of Cyprus shows a map of the country in silhouette form. Countries are often identified by silhouette maps. A silhouette of the Statue of Liberty in New York. Monuments are often identified by their silhouettes. ^ a b McClard, Peggy. "History of Silhouette". History of Silhouette. www.PeggyMcClard.com. Archived from the original on December 5, 2007. Retrieved September 12, 2011. ^ Teall, Gardner (Aug 1916). "Silhouettes Old and New". House & Garden. 30: 20. ^ a b c d Custom Silhouette Pictures by Karl Johnson Archived 2009-01-16 at the Wayback Machine, accessed November 2, 2008. ^ The family name Silhouette is a French form of a Basque surname, Ziloeta; Arnaud de Silhouette, Étienne's father, was from Biarritz in the French Basque Country; this surname, whose Standard Basque or Batua form is Zuloeta, contains the suffix -eta "abundance of" and zilo, Batua zulo, "hole". ^ R. M. Cook (1976). Review of John Boardman 'Athenian Black Figure Vases: A Handbook.' The Classical Review (New Series), 26, pp 253-253. doi:10.1017/S0009840X00248610. ^ Science Daily, accessed November 2, 2008. ^ Good design lies in the foundation, accessed August 18, 2009. ^ Lavater, accessed November 2, 2008. ^ August Edward, accessed November 2, 2008. ^ "Silhouette Sarah | Silhouette Artist, Cutter and Entertainer". www.silhouettecutting.co.uk. Retrieved 2017-01-05. ^ The Silhouette Man, accessed November 2, 2008. ^ Silhouette artist, accessed November 2, 2008. ^ Traditional European paper cuts are different in this regard to traditional Oriental paper cuts which are often made of several layers of brightly coloured and patterned paper, and have many formal decorative elements such as flower petals. ^ Hans Christian Andersen's Paper Cuts in the Royal Library, accessed November 2, 2008. ^ Mister Rob Ryan, accessed November 2, 2008. ^ Robbin, T. (2008). Shadows of reality: the fourth dimension in relativity, cubism, and modern thought. The Mathematical Intelligencer, 30(1), 74-75. ^ "Collection Online | Man Ray. Silhouette. 1916 - Guggenheim Museum". guggenheim.org. Retrieved March 21, 2016. ^ Knipe, P. (2002). Paper profiles: American portrait silhouettes. Journal of the American Institute for Conservation, 41(3), 203-223. ^ google.no, Niğde Alaaddin Mosque where a Chiaroscuro drawing of a woman's face with crown and long hair appears at a specific time of the year. ^ fotogaleri.haberler.com, Divriği Great Mosque and Hospital with the silhouette of a praying man that appears over the entrance door of the mosque part and changes pose as the sun moves. ^ Forensic entomology Archived 2008-05-10 at the Wayback Machine, accessed November 3, 2008. Coke, Desmond (1913). The Art of Silhouette. London: Martin Secker. Jackson, Emily (1911). The History of Silhouettes. London: The Connoisseur. Knipe, Penley (2002). "Paper Profiles: American Portrait Silhouettes". Journal of the American Institute for Conservation. 44 (3): 203–223. McKechnie, Sue (1978). British Silhouette Artists and their Work, 1760–1860. London: Sotheby Parke Bernet. ISBN 0856670367. McLynn, Frank (2005) . 1759:The Year Britain Became Master of the World. London: Pimlico. ISBN 9780712694186. Orr, Inge C. (1974). "Puppet Theater in Asia". Asian Folklore Studies. 33 (1): 69–84. Roe, F. Gordon (1970). Women in Profile: A Study in Silhouette. London: John Baker. ISBN 978-0-212-98364-3. Rutherford, Emma (2009). Silhouette: The Art of the Shadow. New York: Rizzoli. ISBN 978-0-8478-3077-0. Stoichitǎ, Victor (1997). A Short History of the Shadow. Essays in Art & Culture. London: Reaktion. ISBN 978-1-86189-000-9. Sedda, Julia (2014). "Silhouettes: the fashionable paper portrait miniature around 1800". In Pappe, Bernd; Schmieglitz-Otten, Juliane; Walczak, Gerrit (eds.). European Portrait Miniatures: artists, functions and collections. Petersberg: Michael Imhof Verlag. pp. 179–185. ISBN 978-3-86568-969-6. Sedda, Julia (2009). "Reading circles, crafts, and flower arranging: everyday items in the silhouettes of Luise Duttenhofer (1776–1829)". In Goggin, Maureen Daly; Tobin, Beth Fowkes (eds.). Women and Things, 1750–1950: gendered material strategies. Farnham: Ashgate. ISBN 978-0-7546-6550-2. Vigarello, Georges (2016) . The Silhouette: from the 18th century to the present day. Translated by Dörr, Augusta. London: Bloomsbury Visual Arts. ISBN 9781474244657. Reiniger, Lotte: Homage to the Inventor of the Silhouette Film. Dir. Katja Raganelli. DVD. Milestone Film, 1999. "Silhouettes". Paintings & Drawings. Victoria and Albert Museum. Archived from the original on July 12, 2007. Retrieved August 21, 2007. Profile Likenesses of the Executive and Legislature of Georgia (Silhouette Book), by William H. Brown, 1855[permanent dead link] from the collection of the Georgia Archives. Andersen, Jens (2002). "Scissor Writing". Det Kongelige Bibliotek. Retrieved 22 November 2016. Ingersoll, Julia (2003). "Wayang Kulit: the Ancient Shadow Plays of Bali". Gamelan Tunas Mekar. Retrieved 22 November 2016.